HABITS… ALL PART OF THE PROCESS? I’ve been thinking a lot recently about habits. By habits, I mean ingrained ways of thinking or processes that seem to happen on autopilot. Charles Duhigg in his book “The Power of Habit” – which I have to say is an excellent read if you are interested in psychology and self improvement – breaks down the habit into a three step process. A trigger is fired in reaction to something else. This trigger usually happens because of a want or desire (not necessarily a positive one) and results in an action. This culminates in a result. More often than not, both trigger and result are psychological and the action is physical. It isn’t necessarily as clear cut as 1, 2, 3, hey presto, something happens. The action may also occur at the same time as both trigger and result, i.e. sucking your thumb which nurtures and comforts and feeds itself on a sort of cycle. In this instance the word “habit” seems to only relate to smaller action, and I guess that can be said of all habits really. What is interesting is the greater effect of them. 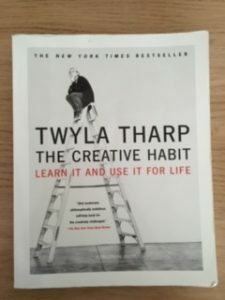 Twyla Tharp in her book “The Creative Habit” – which I have to re-work through at some point – talks about the elements of her creative process and her approach to work, her “habits” if you will, as “rituals”. I think has a lovely sense of ceremony to it and puts a great deal of importance into the creation of work. Again, these seem to be smaller actions though which relate to a larger effect within a process. For instance, Ms Tharp, a former dancer turned choreographer, likes to begin her day with an intensive work out at the gym, to condition and reconnect with her body. Is the habit that she likes to go to the gym? No, she argues. Her habit and ritual is the fact that she steps outside her New York apartment and orders a taxi to take her there. Small action, large result. This process for Ms Tharp sets her up for the day before she attends rehearsals, however it is part of her autopilot system that allows her to create work. In this sense, I guess this is why I have also been thinking about habits, habits that go into the creative process or into the creation of work. Reason being, I don’t feel like I have any! For design work, I have approached every project differently. In performance, I have never had a standard warm up that I have done at the start of every working day. I have always tailored what I am doing to what I think is the most suitable thing to the project – to what the work needs. On the plus side, at least it means I am adaptable. Negatively, the inner artist inside me wails, “What is my process?!”. Perhaps this in itself is a habit. I have the habit of preparing – however arguably I would have thought every creative practitioner must engage in some kind of preparation before undertaking a task. If they don’t, I would hope it would be a part of the process and a well judged opinion not to do so! Within preparation though, I can’t argue I have any habits. I seem to do with what I and the work need. I know of designers and visual artists who seem to go through what I would describe as a Pinterest immersion period, where hundreds of images flood boards and are shared with various collaborators. Directors who, no matter what the piece, will find and read an extensive list of reading material. Visual artists who immediately go wild with a camera. Movement specialists who have done the same warm up for 10 years. These are the rituals these practitioners have in their preparatory phase. Over my time making work, I have done all of these things, but none of them religiously. That if to remove this from my process, I would be lost. As I advance through this stage of creative development, I am paying close attention to what I do and what I don’t do. Maybe this is why my work to date has been so varied, my habit is to adapt and find new appropriate habits to make the work flourish.